How would you like to discover one of the best-kept secrets in the South? My family discovered it nearly 20 years ago and after a recent visit, I felt that I must spread the word about St. Simons Island. Georgia is known for their succulent peaches, world famous golf, the metropolitan city of Atlanta, Jimmy Carter, and Savannah’s stately squares. What you might not know, is that the Barrier Islands start in the Peach state and are full of unspoiled beaches, maritime forests, live oak trees dripping with moss, and coastal delights. St. Simons Island is the largest barrier island. Together, Little St. Simons Island, Jekyll Island, and St. Simons Islands make up The Golden Isles. My visit to St. Simons Island brought me back to the same deep-rooted community spirit that I felt previously. Other than more buildings, houses, and retail shops, St. Simons Island was essentially unchanged. St. Simons boasts fresh food options, gorgeous scenery, and a laid-back island vibe that cannot be explained. The day-to-day pace is slowed down at St. Simons Island, allowing you to appreciate magnificent sunsets, the eye-popping sun rises, lip-smacking food, and Southern hospitality. I invite you and your loved ones, family, or friends, to visit this destination and explore a labor of love between locals and tourists alike. Here are some of my St. Simons suggestions to help you plan your trip! Your home-away-from-home must be the cherished King and Prince Beach and Golf Resort. In fact, the King and Prince Resort and St. Simons Island are pretty much synonymous. The King and Prince understand Southern hospitality and go above and beyond to make your stay memorable (a huge number of guests return year after year). At the King and Prince, you are truly enveloped in island beauty, pristine sandy beaches, crashing ocean waves, and swaying palm trees. There are three room locations: main hotel, beach villa, or resort residences (some of which are dog-friendly). Unless you have a large group traveling with you, spring for an ocean view room in the main hotel. Leave your floor to ceiling sliding glass doors open at night and enjoy hearing the waves sing you to sleep. The rooms’ interior is beach chic done up in demure, relaxing colors. A couch and/or chairs provide additional seating in the room. Rooms also include mini-refrigerators, flat-screen TV’s with CD/DVD players, and a small arsenal of books. The King and Prince’s aesthetically pleasing grounds offer two huge oceanfront pools (3 others throughout the property), children’s play area, Royal Treatment Cottage for massage services, and plenty of spots for relaxing and lapping up the scenery. Rooms include complimentary Wi-Fi, parking, and no resort fees are required. The King and Prince Resort is also a member of the Historic Hotels of America. ECHO, a Southern contemporary oceanfront eatery and bar, is the King and Prince’s onsite restaurant. Chef James Flack and his culinary team serve a foodie-friendly menu that is sure to please. Grab a craft beer sampling from the rotating beers on tap while you munch on Truffle Fries. Handcrafted cocktails and over 40 wines (served by the glass) are also good choices. For dinner at ECHO, I recommend the Tuna Niçoise Salad, Crab Cakes, and the Fried Wild Georgia Shrimp and Grits. The shrimp from Georgia are white, different from other areas of the Atlantic, and they are epic! Melt in your mouth delights. I am sure that whatever you choose from this kitchen will be a winner. Practice your swing on The King and Prince Golf Course’s 18 challenging holes, enhanced with extraordinary southern beauty, lagoons, and salt marshes. If you are not a golfer, perhaps an invigorating game of tennis played on Rubico clay tennis courts or renting a bicycle from nearby Ocean Motion is more your speed. There are 21 miles of bike paths to keep you busy. The King and Prince Resort is also a wonderful place for banquets, meetings, and corporate events. Feel like getting lost on the streets of downtown? Maybe you will turn up at the ever-popular Savannah Bee Company, where you can take home some of the world’s finest honey, natural body care products, and sample their mead. Pier Village has something for everyone and is the social hub of the town. 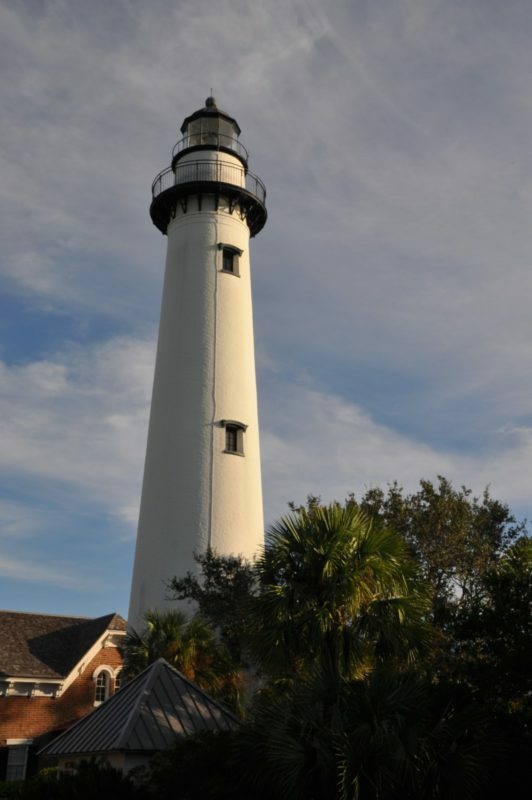 You will find the famous St. Simons Lighthouse here as well as Neptune Park, an oceanside pool, and playground. A climb up the 129 steps to the top of the lighthouse guarantees stellar views. Redfern Village is the ideal place for upscale purchases and browsing. Need transportation? The Lighthouse Trolley has a fleet that can serve your needs. If beaches are a craving, you will enjoy the simple charms of St. Simons Island Driftwood Beach. As the name implies, this beach, located at Northern Jekyll, is dotted with interesting driftwood and trees. Bring your camera as the photo ops are wonderful. Another noteworthy stop is Glory Beach, accessible by a boardwalk that crosses a sand dune. Day trips around the area might include discovering historic Brunswick (one of the most viable ports in the United States) or Jekyll Island, millionaires retreat from 1886-1942. Jekyll Island was the most exclusive club in the world with members such as J.P. Morgan and William Rockefeller. The Jekyll Island Club Hotel is a great place to start your day. Afterward, spring for the $25 tour to possibly enter some of the island’s historic homes. Do not miss Louis Comfort Tiffany’s unsigned work at the Faith Chapel. 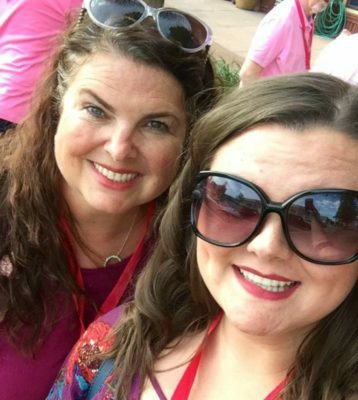 A more adventurous option would be to take a Coastal Georgia Tour or Dolphin Cruise with Cap Fendig and crew. Along the way, you might be greeted with sea life and wildlife, so have your camera ready to go. History buffs will be pleased with all of the choices St. Simons Island offers. Drive through the double row 190-year-old lives oak trees at Avenue of the Oaks en route to see the Fort Frederica (built by General James Oglethorpe) National Monument, Bloody Marsh Battle Site, Christ Church (built 1884), and the First African Baptist Church. A Little Slice of Heaven? The charming community of St. Simons Island puts you under her spell. Maybe that is why Travel + Leisure has named it America’s Most Romantic Town and America’s Favorite Beach Town in the past. Come for a vacation and leave enchanted! Special thanks to Leigh Cort Publicity and the King and Prince for the hospitality, meals, and having me. I did not receive any other form of compensation for this post. As with all posts on this site, all opinions and conclusions are 100% my own and unbiased. The hotel you stayed at looks so comfy! I never heard of this place. Thanks for sharing! We love sharing new things, especially ones as awesome as St. Simons Island. Glad you liked. Thanks for reading. I would love to go visit St Simmon after reading your post. It looks so stunning. Relaxing but also with a lot of fun stuff to do. Sounds like a perfect vacation to me! Great summary Maria, a perfect vacation. 😉 Thanks! Wow, lots of great photos. A day trip is a great idea! I’ve never really associated Georgia with having a coastline, let alone an island! Maybe because Atlanta is so inland. Love this awesome little find and places like this, thanks for sharing. Melody, Thanks for the shout out!!! l really liked how you laid out your post and the conversational style. That was such a wonderful trip and I’m glad we got to experience it together! We are having an unusual cold snap in Washington and I have been dreaming of St. Simons Island. Thanks for helping me get a mini-fix with memories of my time there. Looks like a perfect little place to spend a relaxing vacation at. The King and Prince resort looks really lush, would love to experience the luxury they have to offer! I really like St Simons Island. Always have had great food there too! I love all the faces carved in the trees throughout the island. Yes! I didn’t elaborate much on the faces but we had a thorough chat about them. Very cool. Wow this looks incredible! Will have to try and visit if I am ever in the area! great photos all over St. Simons Island as well! Thanks so much Edd. Appreciate it. Hard to take a bad picture when the scenery is so fantastic. This looks gorgeous and the food looks amazing! I love the look of the resort as well. It looks very relaxing after a full day of sightseeing. This is definitely a great option for a US beach getaway! Does it stay warm here in the wintertime too? I feel the exact same way! Not many people know about St. Simons, but after visiting the Sea Islands a few years ago we cannot wait to get back. It is a unique and beautiful area! We camped when we were there to try to save some money, but would love to try Kings Resort. Maybe next time! Wow! That’s a great little secret. The hotel bed looks so inviting. But I think I’d rather go out and explore outdoor. If we are ever in Georgia again we will definitely put St. Simon’s Island on our itinerary. It’s way more tropical than I was expecting and the resort has a lot to offer. Thanks for posting! Appreciate you reading. 😉 I hope you make it over there. St. Simons is magical. Glad to know! Thanks Alessandra.